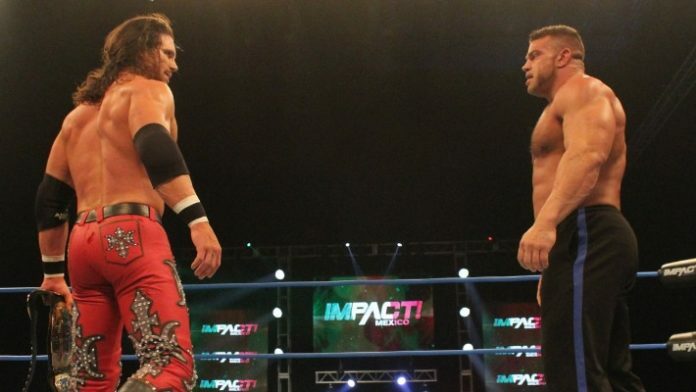 Impact Wrestling presented the first show from their recent tapings in Mexico City this week. Impact Wrestling was back on Pursuit and Twitch last night. The promotion presented the first show from their most recent tapings in Mexico City from Jan. 11-12th. Brian Cage said he would be in Mexico City this week and he was. He showed up in the night’s main event and broke up the match between Kross and Johnny Impact for the title. This did not sit over well with Kross or Moose, who attacked both men. It seems as though Cage won’t stop until he gets his rematch. Last week, LAX antagonized the Lucha Bros, much to Konnan’s dismay. This week, Konnan announced he was bringing in 2 luchadors, one to team with LAX next week and the other to team with the Lucha Bros as the two sides go head-to-head. LAX and the Lucha Bros look like they are headed down the path to a Homecoming rematch. Taya Valkyrie returned to Mexico as Knockouts champion this week. She defeated Keyra in the 2nd match on the show. After the match, Taya cut a promo thanking the fans in Mexico for making her who she is. Taya held the Reina de Reinas championship for 945 days from 2014-2017 while wrestling in AAA, the longest reign in the title’s lineage. She also said she would be waiting for Tessa Blanchard for whenever her suspension is up and would be ready for any of the Knockouts in the meantime. Sami Callihan told Rich Swann if it wasn’t for him, he’d be dead in Baltimore somewhere. The leader of OVE came to the ring after Swann had just defeated El Hijo Del Vikingo in the opener. Callihan revealed the two of them are close outside of the wrestling ring and that Callihan supported him during hard times. Despite this, Swann did not accept Callihan’s offer to join his faction. While he did not specifically say “no”, Swann told Sami he didn’t think he was a good fit for the group. Scarlett Bordeaux will debut as a member of the Knockouts division in 3 weeks. This week she demonstrated a rather interesting training regimen she is running herself through. It’s easy to see how she won her own talent search. While this is speculation, it seems Hogan & Grace will both move back into the non-underworld portion of the Knockouts division. It turns out this was bad speculation as the promotion just announced Hogan & Grace will face Su Yung & Dark Allie next week. The Rascalz picked up two wins this week and Zachary demonstrated he can speak perfect subtitled Spanish in a backstage segment. Zach and Wentz picked up a win over the Desi Hit Squad in tag-team action while Trey Miguel picked up a win in the X-Division by defeating Ethan Page.